We think we have an inspired B&B. The Gspot Adelaide is a luxury, near new, self-contained studio apartment - separate from the house with its own entrance. A fantastic location facing a forest reserve. 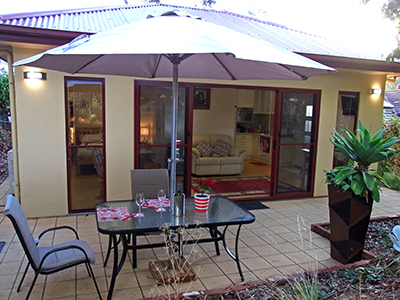 We are close to Belair National Park, just 20-25 minutes drive to Adelaide CBD, Hahndorf or McLaren Vale wineries. Min 2 night stay, our rates are from $85 a night, reduced for longer stays. We also charge a refundable security deposit and a $40 cleaning fee. Your hosts are Jan (semi-retired Web Queen and previous Science Communicator) and Dr Dean (Molecular Biologist). We are close enough to provide help and advice to guests, or separate enough to be invisible. On our side of the fence, we have a Great Dane, 2 cats and 2 chickens, as well as occasional released rescued native birds.